The incident occurred mid-morning on the A train line between two stations in Harlem in northern Manhattan -- left 36 people with minor injuries. Evacuating everyone from the underground station took more than an hour and a half. New York, United States: Dozens of people were injured Tuesday when two New York subway train cars careened off the tracks, leaving hundreds of people stuck for more than an hour, a fire department spokesman said. The incident -- which occurred mid-morning on the A train line between two stations in Harlem in northern Manhattan -- left 36 people with minor injuries, the spokesman told AFP. Evacuating everyone from the underground station took more than an hour and a half, he said. The cause of the derailment, which continued to disrupt traffic throughout the day, was not immediately clear. The Metropolitan Transportation Authority, which manages the city's aging public transit system, said the situation was under investigation. Joseph Lhota, the newly appointed MTA chairman, told a local television station that the derailment would have been preceded by the activation of the emergency brake, but could not say why it had been triggered. One rider described a sudden jolt "like a bucking horse," saying that "people were flying all over the cars." "People were panicking, jumping out of their seats, just crying and praying out loud," said another passenger. "It was just very traumatizing." Riders told of smoke and fire on the tracks, which Lhota explained could have resulted from litter igniting after the crash. The episode intensified scrutiny of New York's antiquated subway system -- one of the world's busiest, with more than 5.6 million average daily trips -- which has drawn the ire of riders as delays soar and incidents build up. 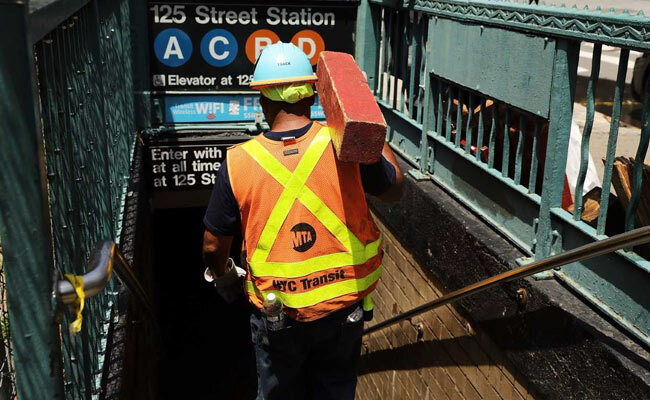 New York State Governor Andrew Cuomo, a Democrat whose office controls funding for the MTA, has vowed to improve the broken system as the frustration of city residents grows. Cuomo turned to Lhota, who is returning to the MTA for a second stint as its chairman, to take on the challenge. Lhota oversaw the subway system's recovery after it was flooded by Hurricane Sandy in 2012.